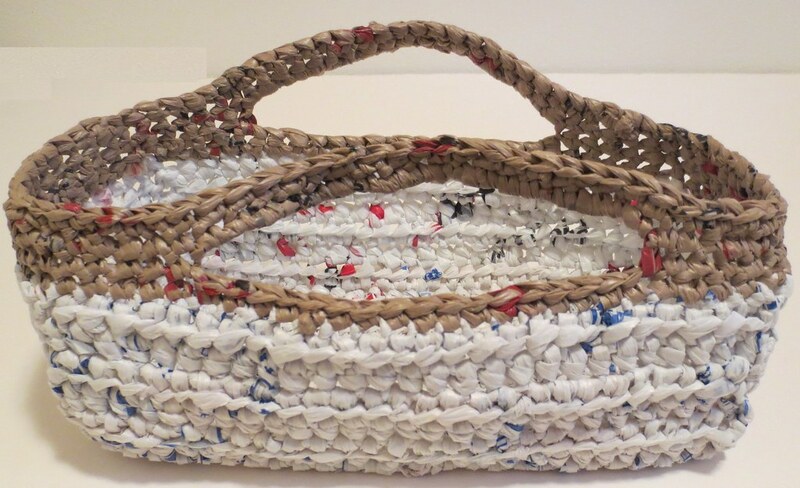 I am back to share a new recycled plastic bag plarn project. In this project, I set out to create a small basket tray to use for holding items for an upcoming charity fundraiser. I wanted a tray type basket to hold the items and also one that could be reused for kitchen or bath items later. This was a fun and quick plastic basket that I crocheted using less than 20 recycled plastic retail bags made into plarn using the looping method of cutting and assembling the bags. Below you will find the free crochet pattern and details. Enjoy the pattern and happy crocheting to all! All pattern details are written in US crochet terms. Hdc in each st across row. Ch 2, turn. Finish off and leave tail for assembling end pieces after row 23. Fold piece after row 6 on each side to create sides for basket. Each side should have 6 rows standing up. Piece should be approx. 8-3/4 inches wide with 2-1/2 inch tall sides at this point. Hdc in each st of row. Ch 2, turn. Finish off and leave tail for assembling ends. After making 2 end pieces, whip stitch the end pieces in place. I worked mainly from the inside so the corners would be defined and the sides would stand up. I found using small pieces of plastic yarn to hold pieces in place helpful as I assembled the ends. Use additional strands of plarn as needed to stitch the end pieces in place evenly. Using brown plarn yarn, attach at any top corner edge, Ch 1, Sc in each st around top edge of basket evenly. Don’t join as the handle portion is worked in the round without joining or turning. Sc around to first long side of basket, Sc in 6 sts (approx. 1-3/4 inches from corner), Ch 18, Sk 16 sts at center, and Sc in last 6 sts of long side of basket. Tip: There should be about a 5 inch center on each long side of basket for handle opening. If your stitch count is a little different, don’t worry and just keep the side openings even and stitches evenly matched on each side of the basket. Plarn patterns vary as you work the projects and stitch counts can vary. Continue working Sc in each st and around to other long side of basket. Sc in 6 sts (approx. 1-3/4 inches from corner), Ch 18, Sk 16 sts at center, and Sc in last 6 sts of long side. This completes the other side handle portion. Now Sc in remaining sts of row. Sc in ea st around to handle chain, Sc around the chain evenly (approx. 19 sts) and then Sc in each st around until you come to the other handle chain. Again Sc evenly around chain and then Sc in each remaining st of side. Sc in ea st around to handle, Sc in each st of handle. Sc in ea st of basket around to the other handle, Sc evenly around the handle, and Sc in ea remaining st of row. Slip st in last st of row and into the next st to finish off evenly with a smooth edge. Weave under all ends and shape basket corners and sides so the basket is square. There are many creative ways to re-purpose plastic bottles into some useful household items. Here is an amazing DIY project to weave a plastic basket from plastic bottles. The idea is to cut the bottles into strips and weave them together to form a basket. You can use the basket to carry or store stuffs. 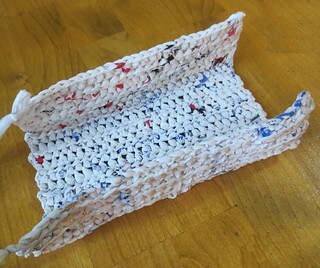 It’s actually more durable than paper woven basket. This is a great project that you show your kids a perfect example of recycling. Enjoy! I like that it’s recycled plastic basket, which are lighter and looking good.